When dad, Matt Potter sent in his #WallsauceMakeover, we knew we had to do more than share his photos. 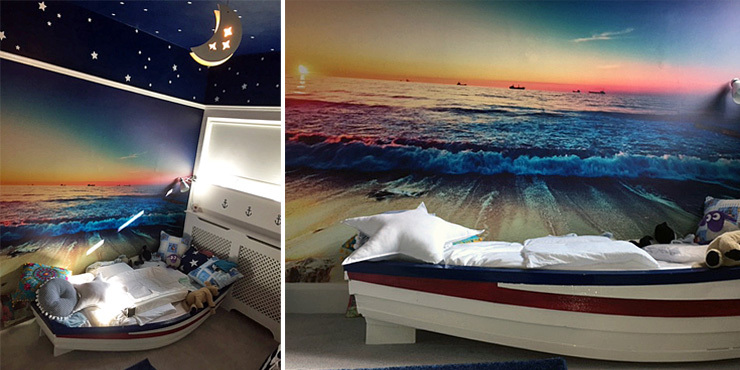 Complete with a boat bed, starry night sky and of course, Wallsauce wall mural, Matt had not only created every little boys’ dream bedroom - we had serious bedroom envy too! 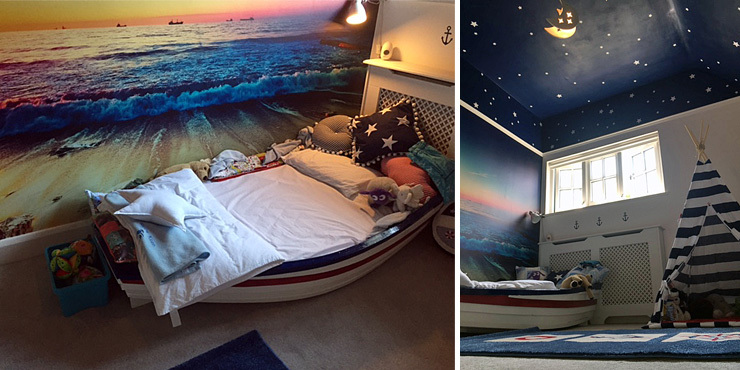 Created for his 4-year-old son, Marlow, Matt and his wife have achieved the ultimate beach themed bedroom. We got in touch with them to find out their tips and advice for creating a wonderful boy’s bedroom. But what we later learned in conversation, was that Marlow has autism, global delay and this bedroom meant a little bit more to them than we thought. 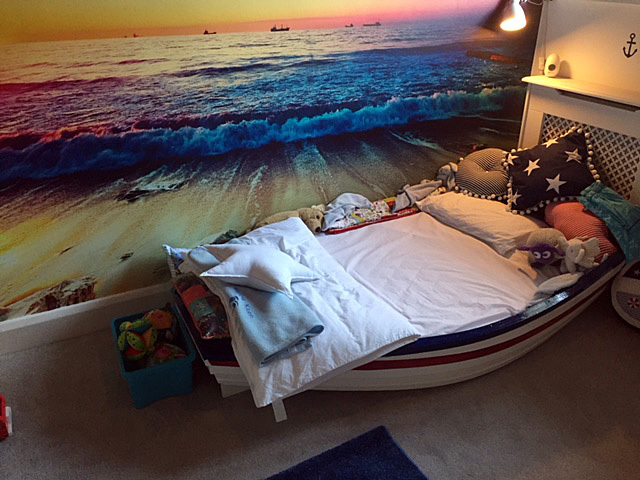 Find out about Matt’s mission to unlock Marlow’s creativity by inventing the ultimate beach themed bedroom and how you too, can create a spectacular boy's bedroom with extra decor tips for children with autism. Having been swooned over by Marlow’s bedroom makeover, we asked Matt about why they chose the beach theme and how he invented such a creative space. 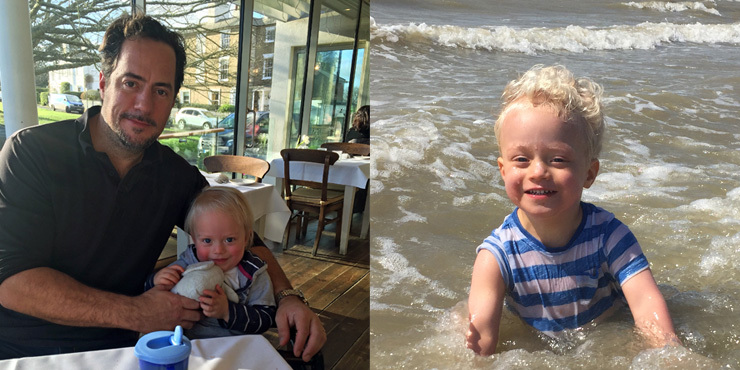 “Marlow is a lovely, fun and intelligent little boy, he also has autism, global delay and doesn't really play conventionally with typical toys,” said Matt. “It's been a challenge to unlock his creativity as his interests are limited and it's difficult to bridge his likes with mainstream activities such as painting/drawing/building bricks etc. He does, however, love his books, his play tent downstairs in our playroom and going to the beach, particularly crashing into the waves. That's when I had the idea for his room, having previously failed to impress him with typical themes for his age. I started by measuring his room and created a moodboard with sketches to scale. I had a lucky find on eBay for his boat, having had no luck scouring the beaches and phoning lots of boating clubs. I restored the boat and changed the interior to accommodate a flat base and we ordered a bespoke mattress. My wife helped to match the colours and give the room a nautical but also a relaxed theme. Not only has Matt created this remarkable bedroom, Marlow’s younger sister, Eliza, also has a beautiful room along with an adapted playroom, garden and playhouse that includes busy boards and a busy box to help with Marlow’s motor skills – AMAZING! Fallen in love with Marlow’s bedroom too? Here’s our advice on creating a themed bedroom for children. Observe your child and watch what they love. Like Matt, think outside of the box. Utilise their mainstream hobbies in how you accessorise their space rather than using them as a theme. Once you have a few ideas, head on over to Pinterest and get creating that moodboard! What we love the most about Matt’s choice of wall mural, is how unexpected it is for a child’s bedroom. Choosing a landscape wall mural instead of your typical children’s mural will allow your child to grow with the room. Don’t forget the fifth wall too! By that, we mean your ceiling. By painting Marlow’s ceiling a shade of navy and adding stars, Matt and his wife have created a calming room that’s going to help with bedtime. Why the bed is so important! 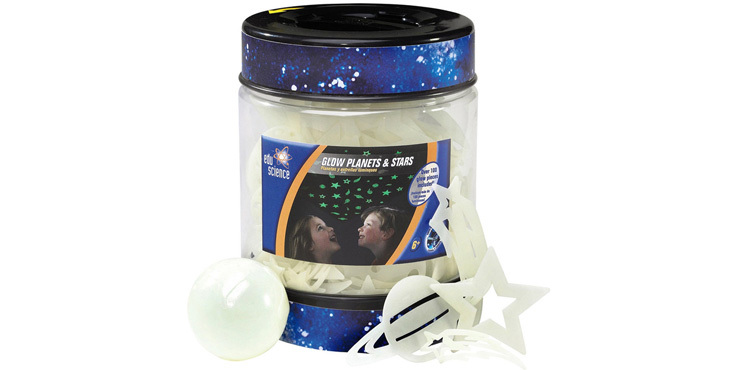 You want to ensure your child’s going to sleep through the night, right? Then picking any old bed won’t do! If you’re not as handy as Matt, then read this post by Dreams on choosing your child’s first bed. We love how Matt has endured Marlow’s love of books. Creating a little den for him to tuck away with his books not only gives him his own space, it’s rather exciting! Whether your child loves to read or loves to paint, creating a work station that can give them the freedom to do what they love is essential. As for the tiny details, note the little anchors on Marlow’s bedroom walls and rug. These tiny details can really bring your theme together! According to Fun and Function, providers of award-winning toys for children with special needs, creating a sensory bedroom that’s also balanced as a space that encourages sleep and relaxation is essential for children with autism. From installing unique lighting to incorporating a flow of soothing lavender aromatherapy, there are many factors to take into consideration when designing their bedroom. For further advice, take a look at Fun and Function’s post on creating a sensory bedroom for children with autism. As the autism spectrum is so vast, it’s worth doing a little research beforehand so that you can cater for your child’s needs. A huge thank you to Matt, Marlow and their family for giving us an insight into this incredible bedroom! If you have any tips for creating a themed bedroom for children or ideas on decorating for a child with autism, please leave them in the comments box below and we’ll share the best in our next post.